Prior to being at Six Flags Over Texas, Rodeo actually called Six Flags Great Adventure home. The ride was installed at Great Adventure in 1999 as a part of their "War on Lines" initiative. In 2005, Six Flags Great Adventure announced that they would be installing a brand new wooden roller coaster, El Toro, for the 2006 season. Rodeo was eventually shipped to Six Flags Over Texas. Rodeo made its debut in 2006 as part of a 10-attraction package for the park’s 45th anniversary. 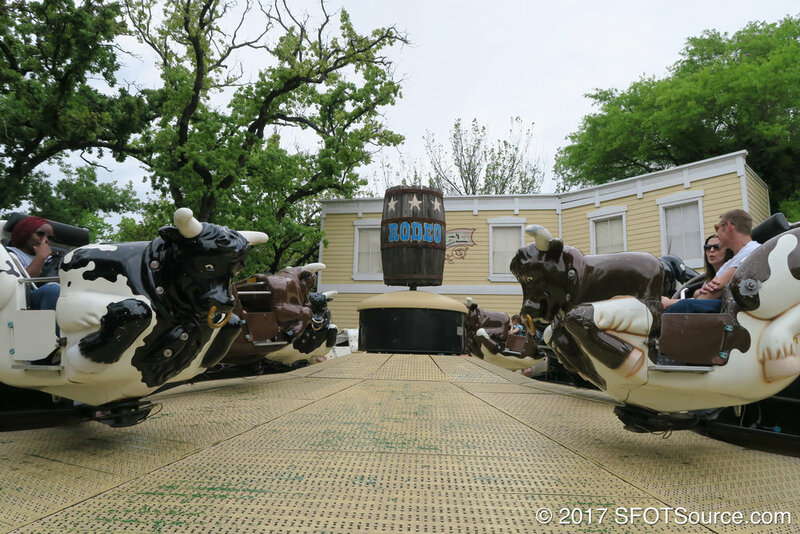 Rodeo is installed at Six Flags Over Texas after being transported from Six Flags Great Adventure. Construction continues at a quick pace on the 45th anniversary attraction package. Many ride signs have now been placed as crews begin to work on landscaping and other details. More progress takes place on the park’s new 10-attraction package as La Fiesta de Las Tazas shows up in the parking lot, installation begins on Rodeo, and much more. Many of the park’s new, upcoming attractions have been installed onto their pads. Work also progresses on the relocation of the El Sombrero attraction to Mexico. Many ride pads have been constructed for the new 10-attraction package. We also take a look at Texas Giant improvements and other changes from opening weekend of the 2006 season. Crews continue to prep areas for attraction installation as many new ride pieces arrive in the park’s parking lot. A look at the early progress on Six Flags Over Texas’ 10-ride package for their 45th anniversary coming in 2006.